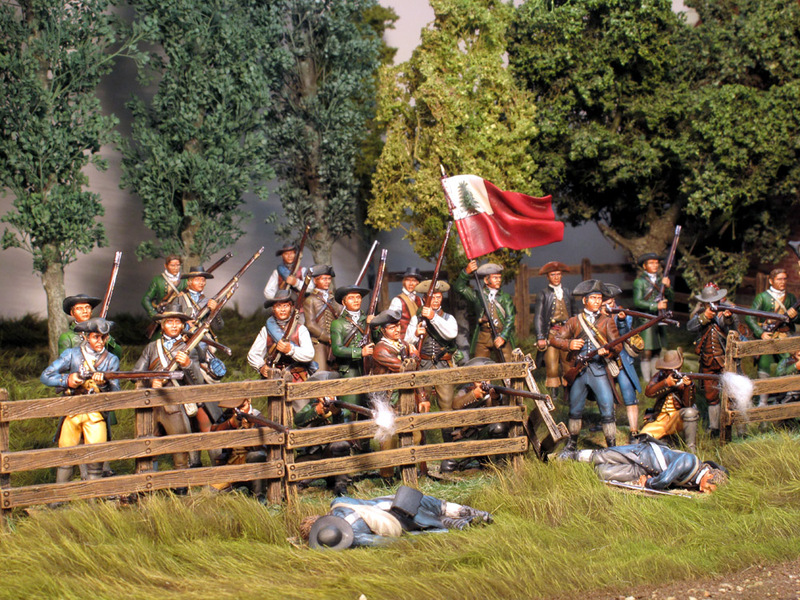 Welcome to our photo gallery for our American Revolution Product range! 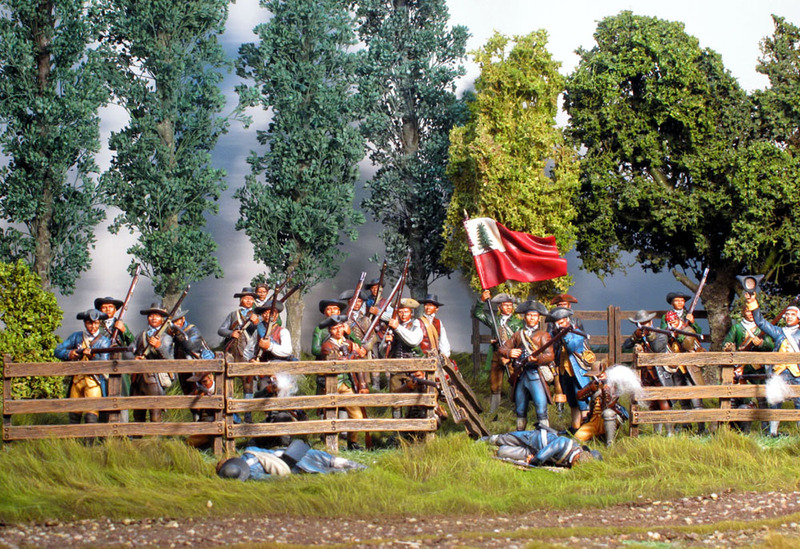 Shown below are figures from our AWI product range in various dioramas and displays. 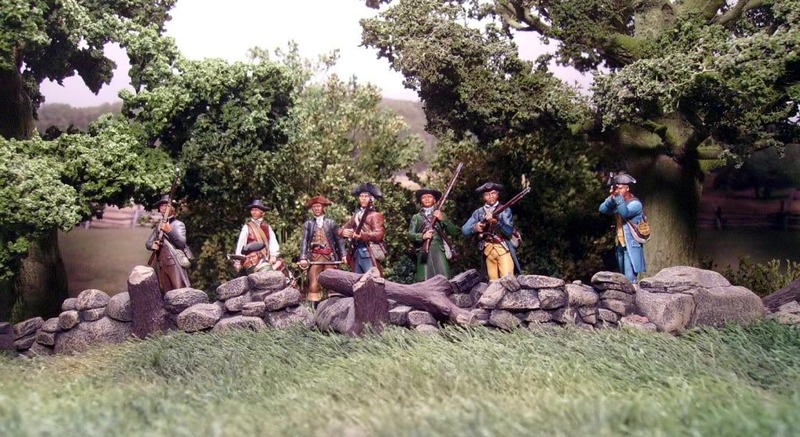 If you have a diorama or display our American Revolution product range and would like to have it included in our customer gallery, please feel free to email us. Enjoy! 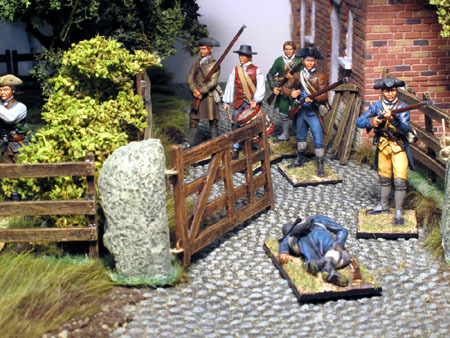 This initial series of six images shows the newly released AWI001-AWI0020 Continental Militia taking up positions in and around Lexington-Concord on April 19th, 1775, the battle that resulted in the famous "Shot heard round the world!" All terrain elements in these pics are commercially available from John Gittens/JG Miniatures in the UK. 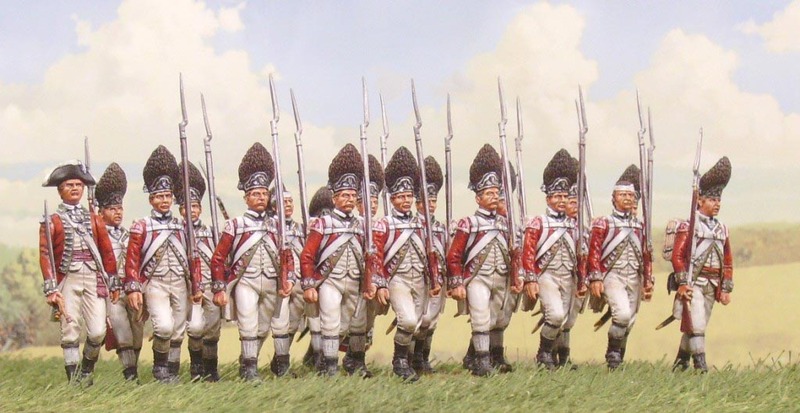 The layout will be modified and expanded once our British 5th Foot Grenadier company is available. 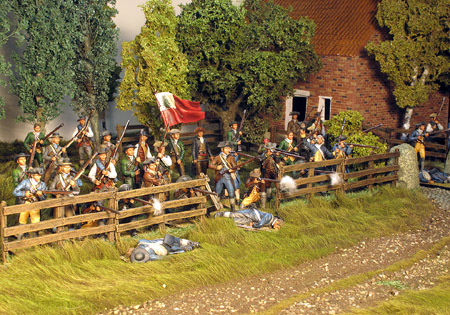 We may even take you to Bunker Hill featuring our own TER003 Artillery Redoubt which is perfect for use with our Continentals! This next set of images was taken by one of our customers in the US of his personal collection. As you can see, his photography is excellent as are his compositions of the figures. We don't have a "Customer Gallery" setup for our AWI range (at least not yet!) so these images have found a home in our main gallery. He also drafted up an interesting historical narrative to give some context to his dioramas. Nearly 500 militiamen from Chelmsford had assembled in the woods on Brooks Hill about 1 mile past Meriam's Corner. 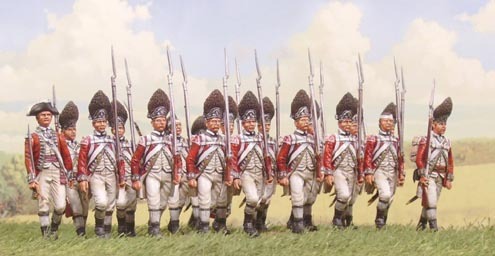 Lt. Col. Smith's leading British forces charged up the hill to drive them off, but the colonists did not withdraw, inflicting significant casualties on the attackers. 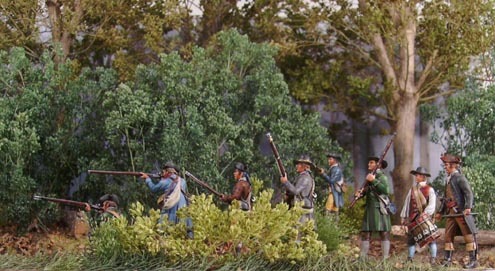 The bulk of Smith's force proceeded along the road until it reached Brooks Tavern, where they engaged a single militia company from Framingham, killing and wounding several of them. 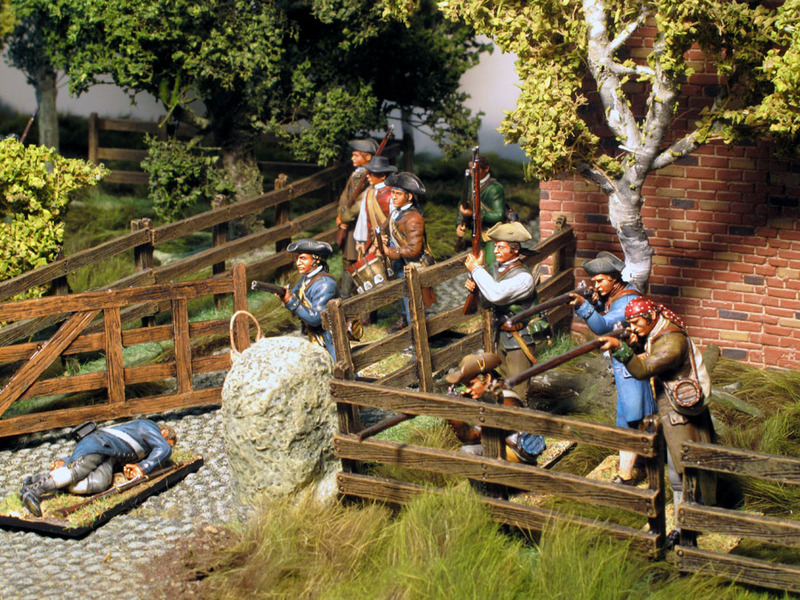 Smith withdrew his men from Brooks Hill and moved across another small bridge into Lincoln. The British regulars soon reached a point in the road where there was a rise and a curve through a wooded area. 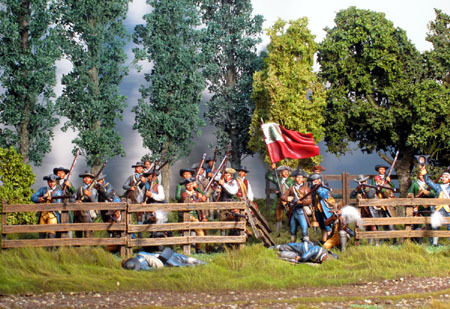 At this point, now known as the "Bloody Angle", 200 men, mostly from the towns of Bedford and Lincoln, had positioned themselves behind trees and stone walls in a rocky, tree-filled pasture for an ambush. Additional militia joined in from the other side of the road, catching the British in a crossfire in the wooded swamp, while the Concord militia closed from behind to attack. 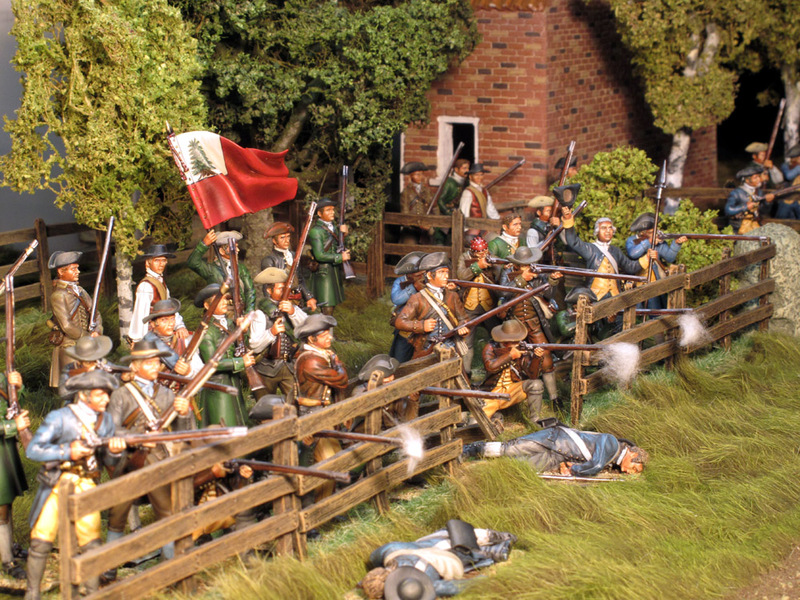 Thirty soldiers and four colonial militia were killed. 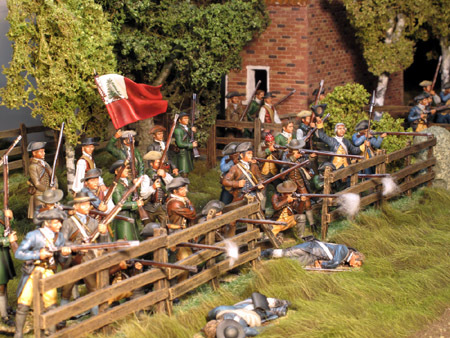 The soldiers escaped by breaking into a trot, a pace that the colonials could not maintain through the woods and swampy terrain.